For some real good barbecue nosh…make it hot dogs! Our recipe include some mouth-watering crispy onions and tangy tomato vodka shots. Time to fire up that BBQ! 1. Heat the barbecue or oven to 200C, Gas 6, cook sausages for 20 mins, turning as needed until golden brown. 2. Meanwhile, fry the chopped onion in the oil for 5 mins to soften. Add the passata, hot sauce, celery salt, tomato ketchup and vodka. Simmer for 10 mins. 3. Heat the oil in a deep frying pan. Spread the flour onto a tray, season. Sprinkle the onions over the flour and stir to coat. 4. Gently put 1 onion ring in the oil – if it floats to the top, bubbles and cooks in 15 seconds, the oil is at the right temperature. Cook the onions in batches until pale golden. Drain on kitchen paper. 5. 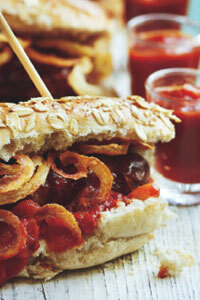 Spread the rolls with some of the tomato sauce, add the sausages and some crispy onions. Top with the roll lids and secure with a cocktail stick. Pour extra tomato sauce in mini shot glasses.